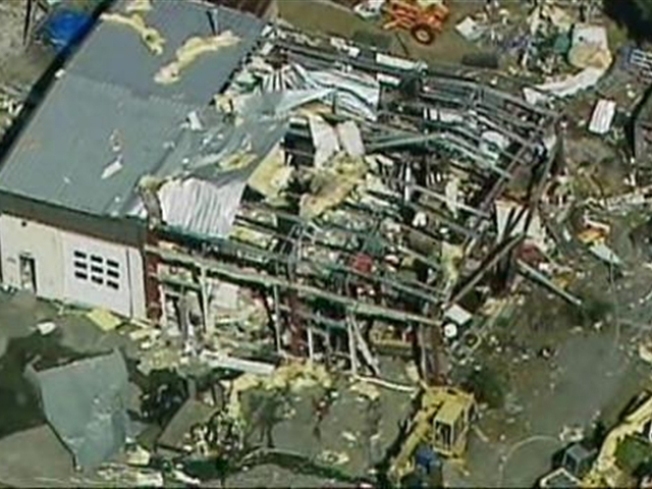 One person was injured during an explosion in New Milford. The owner of a New Milford business is being treated at the burn unit of Bridgeport Hospital after a propane explosion on Thursday morning. It appears that Greg Lee, 50, pushed a button to open a garage door just at his company opened before 8 a.m., igniting propane that had leaked from a tank of a forklift parked inside, a dispatcher told the Associated Press. Lee had smelled propane the night before at his Allen Drive business, but did not think much of it, Capt. Michael Mrazik, of New Milford police, told the News Times. "I'm sure the building was full of propane, but when he opened the door it caused a spark, which caused it to blow," Lee Hendrix, chief of the Gaylordsville Fire Department, told the newspaper. Searchers went into the building looking for two additional employees who were supposed to be there, the News Times reports, but both were late for work. Lee was the only one in the building when the explosion happened. An employee of the nearby Alfredo's Restaurant said the blast shattered windows at the restaurant and sent bottles flying off the shelves. Route 7 was closed between routes 37 and 55 as crews responded to the blast. Volunteers from the American Red Cross have gone to the scene to provide food and beverages for the emergency crews putting out fire at the explosion site.